Bored in the office? Don’t look to 30/20’s new 3D shooter game Office Assassin to find much respite. The game features an office worker named Richard who is trying to get out of doing work by shooting down middle management cronies carrying TPS reports sent down by senior management. You’ll play from Richard’s perspective and shoot down the cronies and help him avoid getting work for the weekend. Gameplay is intuitive and very straightforward, but quickly grows boring and repetitive. Users will point and shoot different cronies within four stages of the game: Cubicle Nightmare, Conference of Cronies, the Lab of Doom, and Mr. Anderson’s Office. Use different weapons like The Ruler, Precise Pen, Slingshot Bop, and the Eliminator to shoot your enemies. Each weapon will have anywhere from 1-2 rates of fire and 1-3 damage capability. Bring the cronies down faster by delivering shots to their heads. And be aware of the red arrows that appear on your left or right side during play–this alerts you to cronies coming from your blindside. Kill the waves of cronies, and you’ll see more persistent cronies. As you survive different waves, stronger cronies in different colored shirts will appear. You’ll need to shoot them several times to kill them. Office Assassin offers decent gameplay, but it’s not a must-buy. There are several problems you’ll encounter with the game. Controls are not responsive enough for a point-and-shoot game. Only two thumbs are required–one to scan/point and one to shoot–but you’ll really have to drag your finger to get to the desired area. I also experienced an annoying amount of lag time from hitting the shoot button and having the shot fire. Graphics were also mediocre. Don’t expect the game to look like the promotions or front screen. The characters don’t look anywhere near as sharp or attractive. Prepared to be disappointed with messy, blurred cartoonish figures that are a hybrid of characters from “Office Space” and “The Office”. The hip hop soundtrack that plays was an annoying loop that didn’t fit in with the theme. Thankfully you’ll have the option of turning off the sound effects and soundtrack. Casual gamers and office workers who want or need to shoot at imaginary co-workers or bosses may be amused, but fans of shooter games will likely be sorely disappointed. Office Assassin has low replay potential, poor graphics, and unresponsive controls. For those who still might be interested, try out the FREE lite version which lets you play through the first two waves of stage one before you lay down $0.99 for the full version. 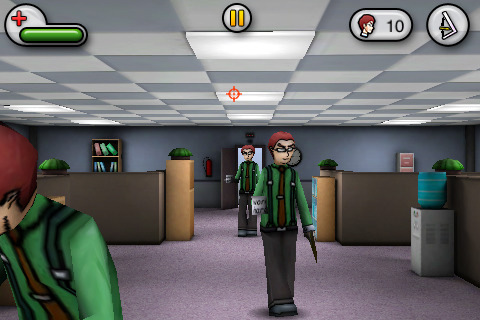 AppSafari review of Office Assassin was written by Linda Ta on March 27th, 2010 and categorized under App Store, First Person Shooter, Games. Page viewed 3895 times, 1 so far today. Need help on using these apps? Please read the Help Page.